A couple of weeks ago, I went with two of my highschool friends to Typika Artisan Roasters at Claremont. The place is a little tucked away but very close to Claremont Quarter. We all wanted to try a few different things so we decided to order 3 meals from their lunch menu and share it between the three of us. My main worry when ordering at a relatively western restaurants or cafes is the taste. I grew up in Asia and I am very used to stronger tastes and western cooking usually taste a little bland to me. However, this worry was a useless one at Typika! The presentation of their dishes is definitely very nice and I love all three of the dishes that we ordered. 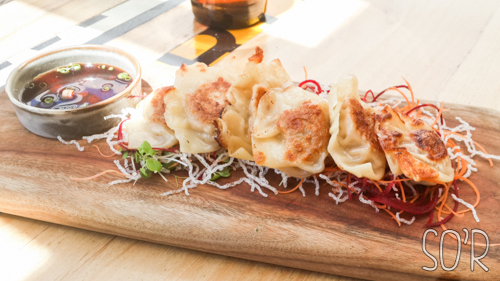 Free-range pork and Shark Bay Blue Swimmer Crab fried and steamed dumplings with a soy and red vinegar dipping sauce. The gyoza is definitely delicious and I’d go back and eat it though I don’t think it is at all Japanese nor if it is supposed to be real Japanese gyoza. It’s yummy and that’s all I care about. 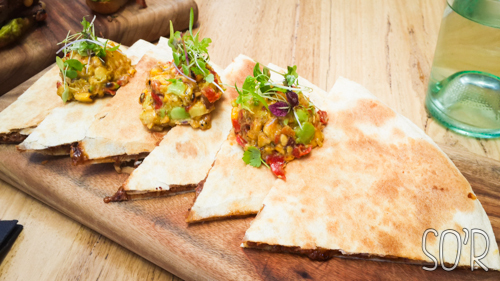 Shoulder of pork, marinated in spices and slow cooked in sarsparilla, shredded and served in a grilled tortilla with cheddar and BBQ sauce, accompanied by a BBQ corn, capsicum and avocado salsa. This is the first time I have tried anything like this. The shredded pork is so fine, soft and smooth that the texture reminded me of canned tuna – in a good way (I love tuna!). The taste is sweet and I am hungry just thinking about it now. 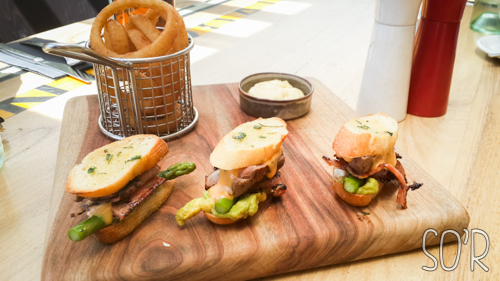 Three mini steak sandwiches on garlic croutes, succulent grilled fillet steak, cream cheese, bacon, asparagus and harissa hollandaise, served with beer battered onion rings and aioli. Yet another yummy dish. All I can say is yum yum yum. I would definitely go back to this place. Although the price is a little high for me to visit and eat often but it’ll be somewhere to go to for when I feel a little fancy. Have you been to Typika? This entry was posted in Foodie and tagged artisan, claremont, crab, Food, gyoza, petite, pork, pullthrough, quarter, quesadillas, roasters, sandwich, sanwich, square, steak, times, times square, typica, Typika, typika artisan roasters, typikaartisanroasters by SitaCarolina. Bookmark the permalink.